The holiday cottage of Sandy Ridge makes an impressive place to take a cottage holiday. Sleeping 8 people, this could be a good location for those wishing to share their time away with friends and family. You'll find Sandy Ridge on next to the sea in Holland-on-Sea, Essex - so very handy for those summer breaks on the beach. 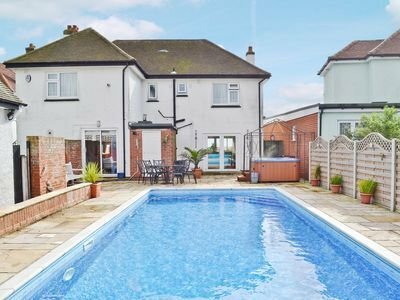 What makes Sandy Ridge a little different from many of the holiday cottages out there is that you have a private hot tub and a swimming pool in the back garden. What a perfect way to spend a summer holiday: you can start the day with a swim in your own pool; then maybe head to the beach for a bit of a play; before spending the evening with some wine in the hot tub! Inside, you'll find that Sandy Ridge has many of the things you would expect from a quality holiday cottage - satellite TV (with another 3 Freeview TVs), a DVD player, an iPod dock and Wi-Fi are all included at Sandy Ridge. There also a washing machine and tumble dryer so you don't need to return home with a car full of dirty washing! As well as that hot tub and swimming pool, you also have a lawned garden and patio area with furniture and a barbeque. Should you want to explore around the area, you've got Clacton-On-Sea a few miles to the south of Sandy Ridge - and this is the place to go if you're looking for plenty of sea-side action; or for a gentler day out, head north for a day at Frinton-On-Sea. The area around Sandy Ridge is "Constable Country" - with villages such as Dedham and Flatford being nearby. You may also want to head into the county town of Colchester, and have a day at the zoo. For coastal walks, cycle rides along the promenade, or a day at Frinton, it's well worth seeing what Sandy Ridge can offer you. Should Sandy Ridge not be to your liking, but you fancy staying in the area around Holland-on-Sea, you might well be interested in the cottages below. All these cottages are within a few miles of Sandy Ridge.